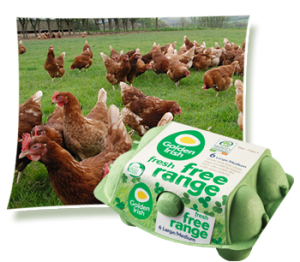 We at Golden Irish, are a happy bunch and we’re egg-stemely happy to tell you that we only sell 100% Free Range Eggs. All of our hens are free to roam about in acres of grassland and do as they please. This is why we say Golden Irish is the Home of Happy Hens. When you buy a Golden Irish egg, you can be 100% sure that it’s welfare friendly and Free Range. Our eggs also come in lots of different varieties – Free Range to Organic, Cornfed to Omega 3 and our new Speciality breed eggs – you can be sure there’s one for you. Our eggs are packed for most of Ireland’s largest retailers along with products for the wholesale and catering market. Our Free Range eggs are laid by the happiest and healthiest hens around. We realise that just like us humans, hens need lots of open space to roam around and exercise to be at their healthiest. Healthier hens mean more nutritious and better tasting eggs, so it’s good for everyone. The yolks are a bright yellow and just bursting with yummy goodness. 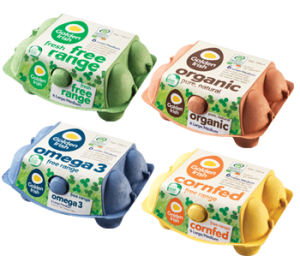 For your convenience, our Free Range Eggs come in a range of sizes to suit your needs. Our hens lay medium, large and very large eggs, all of which you can find in your local supermarket. We also have a very handy 4pk size. These happy hens take their work seriously and demand only the highest standards when to comes to looking after them. This is why they are free to roam in their grassland and also why we only give them 100% organic certified feed. 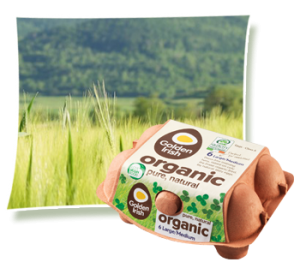 The results are in the taste and most people agree that our Golden Irish Organic Eggs are unrivalled when it comes to yumminess. 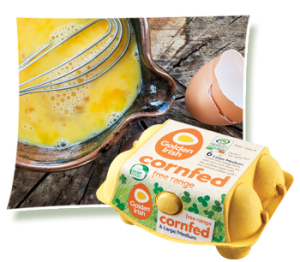 When it comes to yummie, scrummy taste, nothing compares to our Cornfed eggs. Our happy hens are fed a diet rich in nutritious corn and maize which means that when one of our girls lays an egg, it has a richly coloured yolk along with a more intense flavour. Anyone that tries our Cornfed will find it difficult to switch to another egg. They are also great in everything from quiches to queen cakes and add that extra umph. Apart from living in a happy home, our Omega3 hens also enjoy a diet rich in Omega 3. They spend their days eating the most amazing nutrients and because of this, they squeeze as much Omega 3 into their eggs as possible (almost twice as much as regular eggs). For us humans, a diet rich in Omega 3 is good for the heart, brain function and nervous system development. 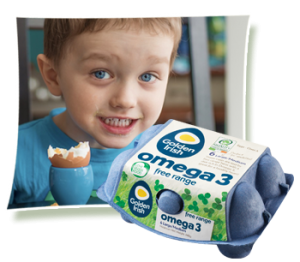 Every 100g of Golden Irish Omega 3 eggs contains 50% of your DHA /EPA requirement.